Toute l'actualité de l'école, vue par les élèves ! Hi Lucas ! So you come from Italy, can you tell us from where exactly ? Hi ! Yes, of course ! My hometown is called Case Rosse, it’s situated just next to Rome. For how long have you been in France ? I’m in France since September, so it’s been 4 months if we take out December considering I took a one-month break at Christmas. I’m here in order to pursue my studies abroad. I’m a PhD student in philosophy and I can get (at most) half of my lessons outside of Italy. So I can take this full year to travel in France and I will see for the first semester of next year. Why France among all ? I came in France 2 years ago for a week on my holydays, and I noticed that being in a French country suited me much more than an English one. English is for me a very useful language even here in France, but I am much more motivated to learn French. However French doesn’t seem as easy as English to me. You’re right, French isn’t that simple but as an Italian I still manage to understand quiet well and to express myself more or less properly, simply because Italian is very close to French and in addition, since I’m studying Latin, it’s even easier. But of course, it doesn’t work everytime, for example, to stop is “fermarsi” while it is “arrêter” and not “fermer” in French. Still, French is far from being a barrier to me. How do you feel in France now that you live here ? I must admit that life seems more comfortable from my point of view in France rather than in Italy. For example, just take the transport system. Either you take your car or public transports, it’s a mess in Rome. You have access to only 2 underground lines in a city bigger than Paris. Also, weather is more pleasant here. But more importantly, current Italian political life and job market aren’t at their best. So, for the moment, I feel better in France. The moment I learned there were Malaysians students in Polytech Grenoble I was immediately intrigued. I had always been aware of France’s assets in terms of education and how attractive it is to foreign students. The diversity of the students that populate Grenoble is undeniably significant, although the foreign students you usually encounter tend to come from East Asia, Northern America or simply from Europe. I met Fatin and Sabrina on the first day of the intensive English course where their story was brought to my attention during a dedicated “Mingle time”. After they quickly explained their background and where they came from, I remained curious about certain details. For instance, the reason they had chosen France as their country of studies and their incredible proficiency in French (that made me wonder if French was taught in Malaysia???) still eluded me. For this reason, I am pleased to get to know more about their story and to share it with you. I thus bring to you Fatin, Sabrina, and their friend Faiz as well –who kindly answered my questions! Did you know? Malaysia is a country located in South East Asia. Its capital is Kuala Lumpur and its official language is Malay and English is a recognized language, which is why some schools teach their students in English. To begin with, please take note that France’s and Malaysia’s educational systems are very different. As Fatin explained during our first English class when asked by our teacher, students in Malaysia are offered the opportunity to study abroad by the government. Their choosing France can seem a bit off in a world where English-speaking countries are besieged with an ever growing number of foreign students and that is what is what my first question dealt with. Me: Why did you decide to study in France and not in another country? Sabrina: The main reason we chose to study in France is the standard of education which is generally high and the reputation of the academic institutions. France offers a wide range of interesting courses, some of which are not available elsewhere. Sabrina went on to praise France’s gastronomy and its landscapes, adding that “for passionate foodies, France is the place where you discover great taste and great execution. Not to forget that France is the perfect place for a vacation. It is a very beautiful country; every part of it is breathtaking and unique”. I then turned to Faiz who shared his own experience of having the opportunity to study abroad right after high school. Faiz: After getting my SPM results, I got a scholarship offered by the Malaysian government to pursue my studies overseas. Honestly, I randomly chose France as it was the first European country that came to my mind at the time. France’s educational standards are somewhat better than in my home country, especially in engineering. I also wanted to learn a new language, which is why I chose France rather than an Anglo-Saxon country. Me: By the way, when did you arrive in France? Fatin: We arrived in 2015, around three years ago. Roughly forty Malaysian students came to France under the program. Fatin got closer from her friends during the one-year course that took place in Tours. She added that there is a Malaysian students’ association in France that organizes various events for Malaysians to meet and get to know each other. The association, called MASAF, gives tips about the life in France and acts as an intermediate platform for the cohesion of Malaysian students. Me: Would you say that many Malaysians have the opportunity to study abroad? Sabrina: To come and study here in France, we had to compete with everyone else to get the national scholarship. It was a challenging process: the outcome greatly depends on your interview performance and your exam results. Sabrina then explained that it is still possible to study abroad without financial aid from the government, but not everyone can afford to pay the tuition fees since the European currency is higher than the Malaysian ringgit. You may have picked up that the Malaysian system does not quite work the French one. Faiz mentioned something about the SPM (the Malaysian Certificate of Education) that Fatin then explained more thoroughly. Me: What are the main differences between France’s and Malaysia’s educational systems? Fatin: The main difference between the two is that we graduate high school with the SPM which is an equivalent of O-levels (Editor’s note: O-levels are now UK’s GCE and are of a slightly higher level than the French brevet). This explains why we had to do a one-year course when we came to France: to make sure we had the level required by French baccalauréat. Fatin: In Malaysia, after graduating from high school, students can choose to pursue their studies by doing a one-year foundation course or a two-year diploma before continuing with a bachelor’s degree. Other than that, the difference between Malaysia and France is that most of the syllabus in Malaysia is taught in English, which is our second official language, while not a great deal of subjects are taught in Malay, our official language. If you have ever conversed Faiz, Sabrina or Fatin, it must have come to your mind that they master the French language perfectly. To study in a foreign country is difficult enough with all the cultural differences and the adaptation to a new lifestyle; hence I came to wonder how they came to learn French. Did they have to hit the ground running and learn it on the spot or was French taught in their schools? Me: How did you learn French exactly? Did you learn it in Malaysia or right here in France? Sabrina: French isn’t a language widely spoken in Malaysia. Actually, we did not speak French at all before coming to France. Thankfully, we had a year of intensive French classes in Blois or in Tours before entering tertiary education. We keep practicing French in school with friends and teachers and in public. After all, the best way to learn a language is in a country where it’s spoken. After the one-year course, many Malaysians elected to pursue with a technical degree in an IUT. Sabrina herself chose this path before applying to enter in PRI in Polytech Grenoble, along with Faiz. As for Fatin, she studies in IESE. They are all first year students. After learning about their background I asked Faiz about his plans for the future. As it turns out, they are all required to serve a 6-year bond in Malaysia, as agreed in the scholarship contract. Apart from that, Faiz does not know in which country he would like to work in the future, but considering his impressive path, there is no doubt that he will find it soon enough. 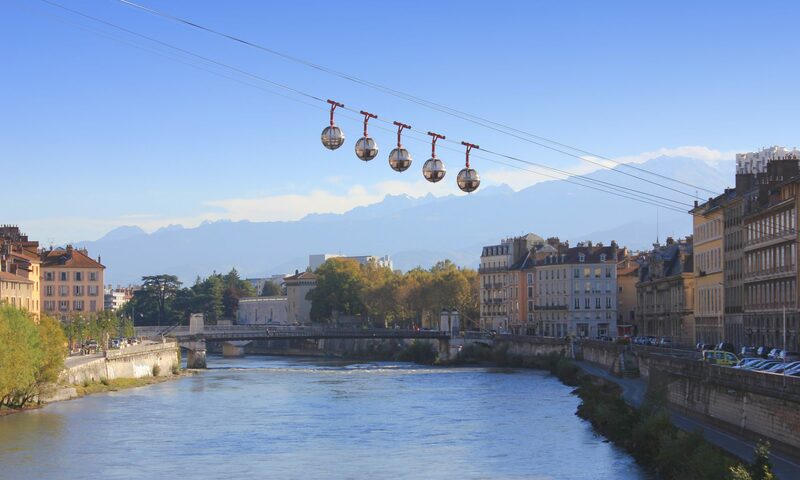 This article will focus on one of the most important associations of Polytech Grenoble. Without its cast, you would have almost no trace of your Polytech years, which would be extremely sad. Always discreet but always present, they are there to immortalize your greatest moments of glory at Polytech. Armed with their cameras they are real little paparazzi, nothing escapes them. They have been rampant now for several generations of students and are known as Objectif Polytech. Julie Dubois (TIS4) is a very active member of Objectif Polytech (and of the BDE) and she kindly agreed to answer a few questions. Élisa: -Hi Julie! Thanks for taking time for this interview. Élisa: – For how long have you been part of Objectif Polytech? Julie: –Since the beginning of last year, arriving at Polytech, it’s been almost a year and a half. I had never really done photography and I did not control my camera at all. Élisa: -Can everyone join OP? Julie: –Yes ! Beginner or professional, we accept everyone, that’s what makes the interest of the association. The more experienced ones share their experiences and their good plans, offer photo releases, themes, and are jury of photo contests. Élisa: -Can we take courses of editing, photo or video with OP? Julie: –Yes, we do photography, video, editing and computer graphics (creating logos and posters). We try to vary the subjects of the courses, this year all the courses of the semester follow a schedule. Élisa: -Are there regular meetings between you to organize? Julie: –Yes and no. When the handover between the old and the new team was made, the choice was made to take a team rather than a single person who manages OP. We asked the most motivated to join a Facebook group conversation dedicated to the organization, but seeing the declining interest of the members of this conversation, we quickly saw that meetings were not necessary. In the end the decisions are made almost alone. For photo staff, outings, themes, etc., it is only the volunteer members who participate. Élisa: -Is OP present at each Polytech event? Julie: -We are trying ! This is not easy because many members do not have a camera and some are interested only in the photo (they are less present in the atmosphere Polytech and therefore less present at parties). There is also a lack of publicity somehow, I think in particular about the administration that uses UGA photographers rather than OP, for example. Élisa: -How much time do you spend on average per week for OP? Are there busier times than others during the year? Julie: –There is not really any average time .. In general, there is 1h of lessons per week, which must be prepared, then we try to organize in parallel outings and photo contest or directing short films on a weekend. But in addition to all that, there is the treatment of photos taken at events. The more we are present, the more work is added. During integration at the beginning of the year, this is where we have the most work. There are about 5000 photos to process! Once the integration is over, there is the gala 2 weeks later that also requires a lot of work. I would say this is the most complicated period at OP. And a contest has just ended, so do not forget to check out the winning picture directly on Facebook ! Marcelo is from Brazil. He arrived in France on August 25th, all the way from Sao Luis, a town located in Maranhao. Current student in the IESE department, he explains how he managed to be a student of Polytech Grenoble for a whole year, and how he lives it. Fond of learning, and passionate about electronics, his teacher in Brazil happens to be the coordinator of the “Bravitech” agreement, which facilitates student exchange between Brazil and France. He thus told Marcelo about it, and this is how a long fight started, to get chosen as an exchange student. One of his struggles was to learn how to speak French. He explains that « It was difficult because [he] had to do a French level test, but did not know anything about French! So [he] started studying in February” for these tests which were in March. That is a month and a half to study. And in only a month, Marcelo managed to master this language and to pass his French exam hands down. Then there was a rather tough selection: three available positions, for only five students. “It was hard,” Marcelo explains, “as the selection is done mainly on the language and our specific fields (electronics, controls etc)”. You might wonder, why France of all countries if he did not speak a word of French before his first French exam? Well, in Brazil, not everyone has the opportunity to travel, let alone travel abroad. For Marcelo, this was an opportunity to learn a new language, to discover a new culture, as well as a chance to improve his resume. Nowadays, not all students are lucky enough to travel and study abroad. So when the opportunity arose, he took it with no hesitation. However, Marcelo had never been to France. Everything was new, as it was an experience that was extremely different from what he had already experienced. He had never left his country, never been abroad. So to prepare his trip, he sought a lot of information, asked friends who already were in France how it was. He said « I asked my friends from Brazil (amongst which three were from the same city as me) who have already returned to Brazil, and also the other Brazilians who were already in France. They all helped me a lot ». As he was always looking for what he needed to improve his stay in France, he met a lot of Brazilians through Facebook, Whatsapp, and made a lot of new friends. Out of all his Friends, he knows a lot of Brazilians, but many foreign students too! He is integrated thanks to the “TDs” and “TPs”. Indeed, one can exchange with the pupils and ask for help, or help them etc. This helps to get to know everyone a little more, and considering “the students are very nice here”, it is therefore easy to feel integrated and to make a lot of new friends. The reason he chose electronics is because since his childhood, he enjoyed everything related to this subject. « I think it’s a question of vocation” he explains. There are a lot of things to do, such as the production of systems, embedded systems, production of a prototype, and projects for companies, on any topics related to energy, electricity. As for Marcelo, he works mostly with embedded systems and the wireless network. What he enjoys the most in it is « how electronic devices, in the development of new systems, can solve everyday problems.” He studied this field in Brazil, and he here « saw the opportunity to develop [his] knowledge and skills on the subject”. Indeed, he explained how « and some subjects are different, some subjects are similar”. Compared to Brazil, the teachers’ teaching is almost the same. But the teaching system is completely different. Indeed, in France there are “TD” and “TP”. In Brazil, they also have “TPs”, but differently. Here at Polytech Grenoble in the IESE depatment, for example, we have a theoretical week on one topic, then a week of practice on the same topic. In Brazil, they study a particular subject in a whole for an entire semester, and the following semester they practice on the same subject in said “TPs”. Marcelo has so far spent three months in Grenoble and thinks it’s a wonderful town, which is well developed and organized. But even though he fell in love with Grenoble, he wants to work in Brazil, and export to his country the experience he gained in France. He actually plans on finishing is Master’s degree to then work in his hometown. When asked why he did not want to work in France, he answered “the most important thing, is family”. To him, it’s not healthy to be away from his family for too long. Moreover, he is the first member of his family to ever leave the country. It was thus a difficult change for his family, especially since his parents are old, but they are still very proud of him and believe their son to be very lucky to have this opportunity. « I miss them”, is what Marcelo said as he was talking about his family. He misses his town too, mostly because of the cold here in Grenoble. Indeed, temperaturs never go below 22.2°C in his hometown! The food is also very different: he misses Brazilian food, which is very spicy, and very typical. A funny fact: in France, Couscous is served for lunch. In Brazil? They eat Couscous for breakfast! As he was born near beaches, he has never seen snow, so he enrolled in a Ski course, in order to enjoy snow during his stay in France. Today, Marcelo plans on visiting Paris, Bordeaux, Orléans, Nice and Marseille with his Brazilians friends during Christmas holiday, and keeps enjoying the wonders of Grenoble every day. Tu es étudiant à Polytech Grenoble ? Deviens contributeur du blog, et écris des articles sur les associations, les sorties, les élèves… Tu es libre ! Laisse enfin s’exprimer tes qualités de journaliste !